3Department of Obstetrics and Gynecology, Faculty of medicine, Alazhar University, Cairo, Egypt. Objective: to evaluate the role of second trimester uterine artery Doppler ultrasound velocimetry (UADV), maternal serum Inhibin-A andplacental growth factor (PLGF) concentrations and as predictors of preeclampsia. 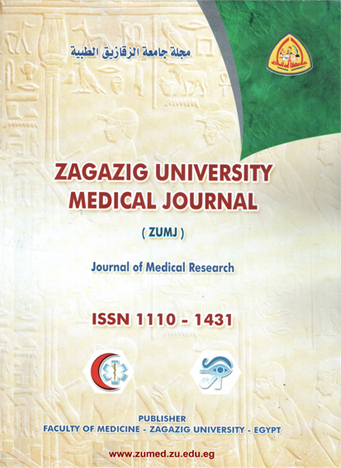 Methodology: This prospective study was conducted at Obstetrics & Gynecology department, Alazhar University hospitals, Cairo, Egypt between May 2012 and May 2014. Ninety low risk normotensive singleton pregnant women were recruited for the study. Blood samples were collected at 16- 18 weeks, centrifuged to extract the serum then stored at – 80 °C until tested for inhibin-A and free PLGF levels. At 22-24 weeks, bilateral uterine artery Doppler velocimetry were recorded. The primary outcome was preeclampsia defined as hypertension with proteinuria after 20 weeks gestation. Women who developed preeclampsia were compared against normotensive control group.Statistical analysis: Receiver operating characteristics (ROC) curves were used for detection of the sensitivity and specificity and cut off value for each predictor using SPSS version 21 for analysis (IBM Inc., Chicago, Illinois, USA). Results:Eight cases out of 90 had developed preeclampsia. Women who developed preeclampsia had significantly higher median uterine artery resistance index (UARI) (0.645 ± 0.3 vs. 0.485 ± 0.16, P = 0.009) and significantly lower median uterine artery pulsitility index (UAPI) (0.625 ± 0.24 vs. 1.0 ± 0.68 with P= 0.001) than normotensive control group.Maternal serum inhibin-A level was significantly higher in women with preeclampsia than the normotensive control group (1375 ± 1431 vs. 540 ± 1900 with P = 0.016) while level of PLGF was non-significantly lower in women with preeclampsia than the normotensive control group (275.5 ± 369 vs. 390 ± 583 with P = 0.156). ROC curves were analysed for cases and control groups, areas under the curve (AUC) was 0.709 (95% CI, 0.527– 0.891, P = 0.016) for UARI with sensitivity of 87.5%, specificity 74% at cut off value ≥ 0.5650, AUC was 0.848 (95% CI, 0.742– 0.955, P = 0.001) for UAPI with sensitivity of 80%, specificity 74% at cut off value ≤ 0.735, AUC was 0.758 (95% CI, 0.566 - 0.951, P = 0.016) for Inhibin-A with a sensitivity of 75%, specificity of 80% at cut off value of ≥ 832.5 pg/ml and finally AUC was 0.652 (95% CI, 0.447 – 0.858 and P = 0.165) for PLGF with a sensitivity of 74% and specificity of 50% at cut off value of ≤ 205 pg/ml. Conclusion: second-trimester uterine artery Doppler indices, serum Inhibin-A and PLGF and may be helpful as a predicting markers for preeclampsia.